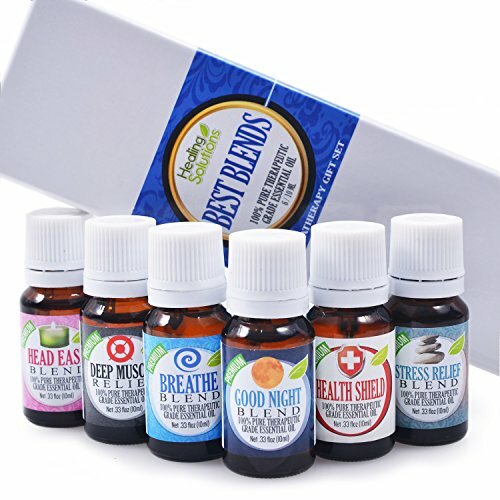 The Best Blends Top 6 contains the following 100% Pure Therapeutic Grade 10ml Essential Oils:Breathe, Good Night, Head Ease, Muscle Relief, Stress Relief, and Health Shield Breathe Blend is a blend of the following oils: Peppermint, Rosemary, Lemon & Eucalyptus. Good Night Blend is a blend of the following oils: Lavender, Marjoram, Roman Chamomile, Ylang Ylang, Sandalwood, and Vanilla. Head Ease Blend is a blend of the following oils: Wintergreen, lavender, peppermint, frankincense, cilantro, marjoram, roman chamomile, basil, and rosemary. Deep Muscle Relief Blend is a blend of the following oils: Wintergreen, camphor, peppermint, blue tansy, German chamomile, helichrysum, and osmanthus. Stress Relief Blend is a blend of the following oils: Bergamot, Patchouli, Blood Orange, Ylang Ylang & Grapefruit. Health Shield is a blend of the following oils: Cinnamon, Clove, Eucalyptus, Lemon and Rosemary. The Leading Aromatherapy Associations (Alliance of International Aromatherapists (AIA), International Aromatherapy and Aromatic Medicine Association, Aromatherapy Trade Council, and others) all state that essential oils should not be taken internally (regardless of purity or organic origin) unless under the guidance of a health care practitioner trained at an appropriate level . As such, all of our oils carry a label warning that the product is NOT FOR INTERNAL USE. 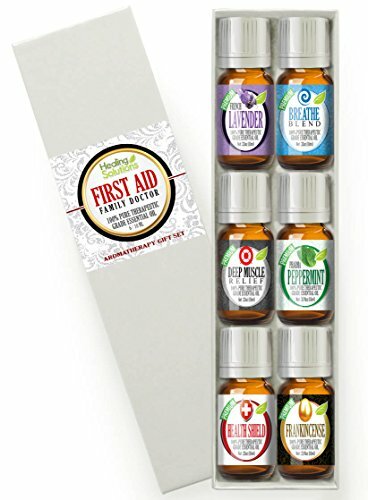 The First Aid Essential Oil Set contains the following 100% Pure Therapeutic Grade 10ml Essential Oils:Breathe, Frankincense, French Lavender, Muscle Relief, Peppermint Pharma Grade, and Health Shield Breathe Blend is a blend of the following oils: Peppermint, Rosemary, Lemon & Eucalyptus. Deep Muscle Relief is a blend of the following oils: wintergreen, camphor, peppermint, blue tansy, German chamomile, helichrysum, and osmanthus. The Leading Aromatherapy Associations (Alliance of International Aromatherapists (AIA), International Aromatherapy and Aromatic Medicine Association, Aromatherapy Trade Council, and others) all state that essential oils should not be taken internally (regardless of purity or organic origin) unless under the guidance of a health care practitioner trained at an appropriate level . As such, all of our oils carry a label warning that the product is NOT FOR INTERNAL USE. TThe Daily Blessing Set includes the following oils: Lavender, Lemon, and Peppermint The Leading Aromatherapy Associations (Alliance of International Aromatherapists (AIA), International Aromatherapy and Aromatic Medicine Association, Aromatherapy Trade Council, and others) all state that essential oils should not be taken internally (regardless of purity or organic origin) unless under the guidance of a health care practitioner trained at an appropriate level . As such, all of our oils carry a label warning that the product is NOT FOR INTERNAL USE. The Natural Femininity Set includes the following oils: French Lavender, Love Blend, Peru Balsam, PMS Relief Blend, Rosemary, and Sage The Leading Aromatherapy Associations (Alliance of International Aromatherapists (AIA), International Aromatherapy and Aromatic Medicine Association, Aromatherapy Trade Council, and others) all state that essential oils should not be taken internally (regardless of purity or organic origin) unless under the guidance of a health care practitioner trained at an appropriate level. As such, all of our oils carry a label warning that the product is NOT FOR INTERNAL USE. Our 100% pure Coconut (Fractionated) (Cocos nucifera) oil stays liquid, is crystal clear, and is an ideal choice for use in creams, lotions and many other cosmetic uses, as well as being an excellent carrier for your aromatherapy needs. The Leading Aromatherapy Associations (Alliance of International Aromatherapists (AIA), International Aromatherapy and Aromatic Medicine Association, Aromatherapy Trade Council, and others) all state that essential oils should not be taken internally (regardless of purity or organic origin) unless under the guidance of a health care practitioner trained at an appropriate level . As such, all of our oils carry a label warning that the product is NOT FOR INTERNAL USE. 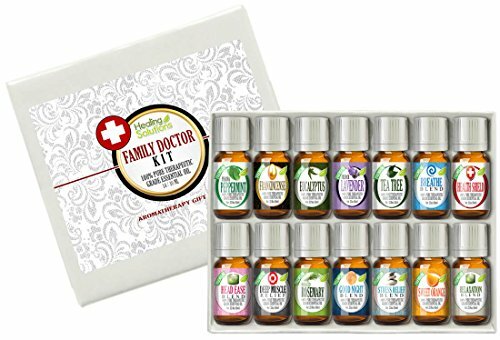 The Family Doctor Essential Oil Set contains the following 100% Pure, Organic Therapeutic Grade 10ml Essential Oils:Breathe, Eucalyptus, Health Shield, Frankincense, Good Night, Head Ease, French Lavender, Muscle Relief, Sweet Orange, Peppermint Pharma Grade, Relaxation, Rosemary, Stress Relief, and Tea Tree Breathe Blend is a blend of the following oils: Peppermint, Rosemary, Lemon & Eucalyptus. Good Night Blend is a blend of the following oils: Lavender, Marjoram, Roman Chamomile, Ylang Ylang, Sandalwood, and Vanilla. Head Ease Blend is a blend of the following oils: Wintergreen, lavender, peppermint, frankincense, cilantro, marjoram, roman chamomile, basil, and rosemary. Deep Muscle Relief Blend is a blend of the following oils: Wintergreen, camphor, peppermint, blue tansy, German chamomile, helichrysum, and osmanthus. Stress Relief Blend is a blend of the following oils: Bergamot, Patchouli, Blood Orange, Ylang Ylang & Grapefruit. Health Shield is a blend of the following oils: Cinnamon, Clove, Eucalyptus, Lemon and Rosemary. Relaxation Blend is a blend of the following oils: Lavender, Marjoram, Patchouli, Mandarin, Geranium & Chamomile. The Leading Aromatherapy Associations (Alliance of International Aromatherapists (AIA), International Aromatherapy and Aromatic Medicine Association, Aromatherapy Trade Council, and others) all state that essential oils should not be taken internally (regardless of purity or organic origin) unless under the guidance of a health care practitioner trained at an appropriate level . As such, all of our oils carry a label warning that the product is NOT FOR INTERNAL USE. 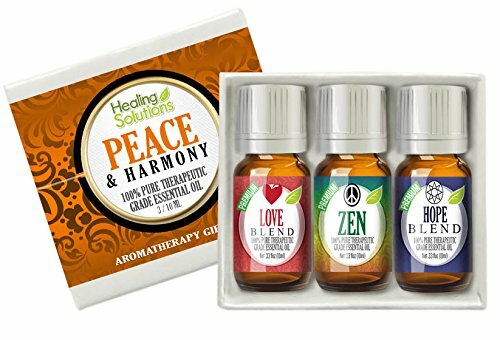 The Peace & Harmony Blends Set includes the following oils: Love, Hope, and Zen The Leading Aromatherapy Associations (Alliance of International Aromatherapists (AIA), International Aromatherapy and Aromatic Medicine Association, Aromatherapy Trade Council, and others) all state that essential oils should not be taken internally (regardless of purity or organic origin) unless under the guidance of a health care practitioner trained at an appropriate level. As such, all of our oils carry a label warning that the product is NOT FOR INTERNAL USE. 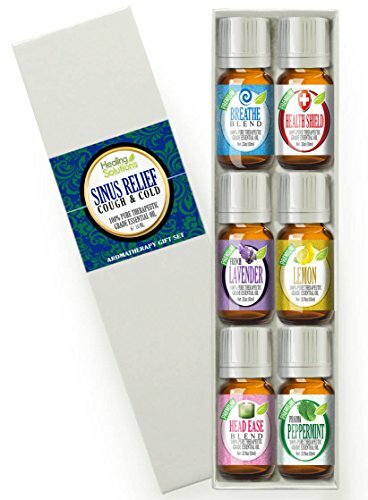 6 bottle set The Leading Aromatherapy Associations (Alliance of International Aromatherapists (AIA), International Aromatherapy and Aromatic Medicine Association, Aromatherapy Trade Council, and others) all state that essential oils should not be taken internally (regardless of purity or organic origin) unless under the guidance of a health care practitioner trained at an appropriate level . As such, all of our oils carry a label warning that the product is NOT FOR INTERNAL USE. The Essential Earth Set includes the following oils: Cypress, Frankincense, Fir Needle, Pine, Meditation, and Patchouli The Leading Aromatherapy Associations (Alliance of International Aromatherapists (AIA), International Aromatherapy and Aromatic Medicine Association, Aromatherapy Trade Council, and others) all state that essential oils should not be taken internally (regardless of purity or organic origin) unless under the guidance of a health care practitioner trained at an appropriate level. As such, all of our oils carry a label warning that the product is NOT FOR INTERNAL USE. 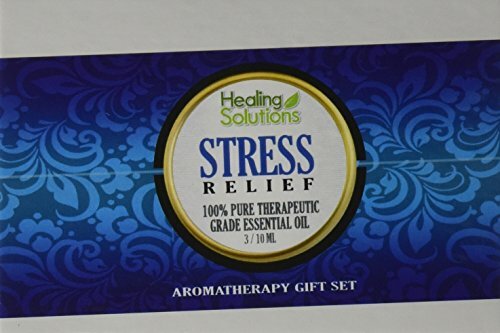 100% Pure Therapeutic Grade Stress Relief blend Bergamot, Patchouli, Blood Orange, Ylang Ylang, Grapefruit Comes in an amber glass essential oil bottle. European Dropper Cap included. What sets Healing Solutions Essential Oils apart is superior cultivation of ingredients that are the best in the world. Combined with superior distillation and bottling care process, We GUARANTEE that our oils are aromatically superior and more effective than any other oils - if you disagree we will refund your money! Zen The Leading Aromatherapy Associations (Alliance of International Aromatherapists (AIA), International Aromatherapy and Aromatic Medicine Association, Aromatherapy Trade Council, and others) all state that essential oils should not be taken internally (regardless of purity or organic origin) unless under the guidance of a health care practitioner trained at an appropriate level . As such, all of our oils carry a label warning that the product is NOT FOR INTERNAL USE. 100% Pure Therapeutic Grade Cleaning Blend Lemongrass, Lemon Eucalyptus, French Lavender, Rosemary , Tea Tree Comes in 10ml amber glass essential oil bottle. European Dropper Cap included. What sets Healing Solutions Essential Oils apart is superior cultivation of ingredients that are the best in the world. Combined with superior distillation and bottling care process, We GUARANTEE that our oils are aromatically superior and more effective than any other oils - if you disagree we will refund your money!" The Leading Aromatherapy Associations (Alliance of International Aromatherapists (AIA), International Aromatherapy and Aromatic Medicine Association, Aromatherapy Trade Council, and others) all state that essential oils should not be taken internally (regardless of purity or organic origin) unless under the guidance of a health care practitioner trained at an appropriate level . As such, all of our oils carry a label warning that the product is NOT FOR INTERNAL USE. 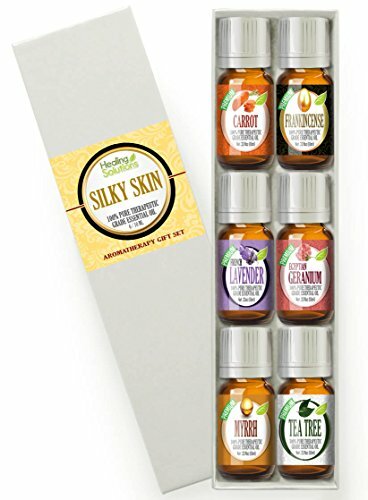 The Silky Skin Set includes the following oils: Carrot, Frankincense, French Lavender, Geranium, Myrrh, and Tea Tree The Leading Aromatherapy Associations (Alliance of International Aromatherapists (AIA), International Aromatherapy and Aromatic Medicine Association, Aromatherapy Trade Council, and others) all state that essential oils should not be taken internally (regardless of purity or organic origin) unless under the guidance of a health care practitioner trained at an appropriate level. As such, all of our oils carry a label warning that the product is NOT FOR INTERNAL USE. The Stress Relief Blend Set includes the following oils: Calm Body / Calm Mind, Relaxation, and Stress Relief The Leading Aromatherapy Associations (Alliance of International Aromatherapists (AIA), International Aromatherapy and Aromatic Medicine Association, Aromatherapy Trade Council, and others) all state that essential oils should not be taken internally (regardless of purity or organic origin) unless under the guidance of a health care practitioner trained at an appropriate level . As such, all of our oils carry a label warning that the product is NOT FOR INTERNAL USE. 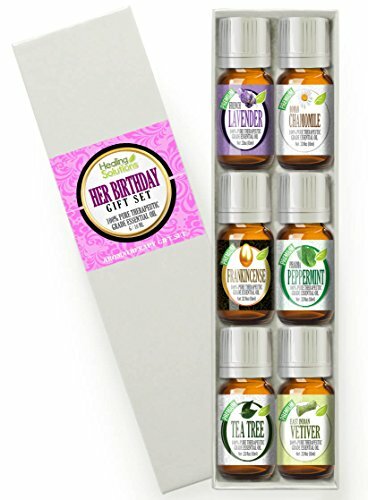 The Birthday Gift for Her Set includes the following oils: Frankincense, French Lavnder, Peppermint, Roman Chamomile, Tea Tree, and Vetiver The Leading Aromatherapy Associations (Alliance of International Aromatherapists (AIA), International Aromatherapy and Aromatic Medicine Association, Aromatherapy Trade Council, and others) all state that essential oils should not be taken internally (regardless of purity or organic origin) unless under the guidance of a health care practitioner trained at an appropriate level . As such, all of our oils carry a label warning that the product is NOT FOR INTERNAL USE. 100% Pure Therapeutic Grade Purification Blend Citronella, Lemongrass, Rosemary, Tea Tree, Kashmir Lavender, French lavender Comes in 10ml amber glass essential oil bottle. European Dropper Cap included. What sets Healing Solutions Essential Oils apart is superior cultivation of ingredients that are the best in the world. Combined with superior distillation and bottling care process, We GUARANTEE that our oils are aromatically superior and more effective than any other oils - if you disagree we will refund your money!